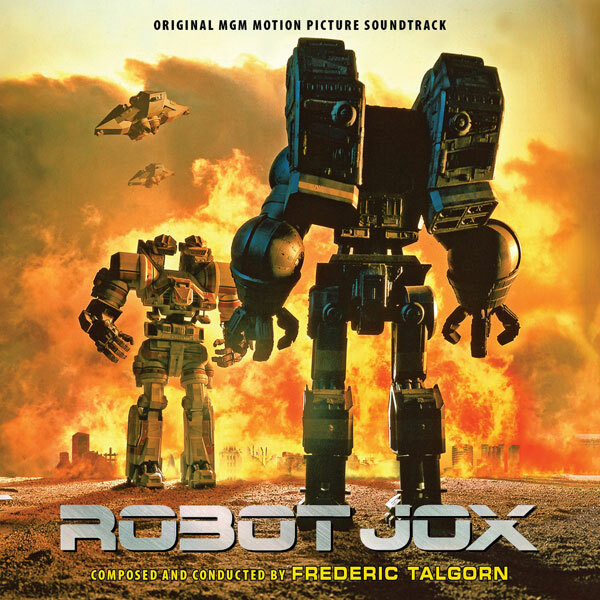 Intrada presents an expanded reissue of Frederic Talgorn's soaring orchestral score to the 1990 sci-fi film Robot Jox. One of the most ambitions projects produced by Charles Band, it featured a large orchestral score by a composer new to the Empire scene. But he gave the film an epic sheen making the action on screen perhaps more grandiose than the budget would really allow, making it a very prominent and artistic element of the film. Worth noting is Talgorn's unique orchestra mix. While the traditional orchestral layout prevails—violins on the left, violas largely centered, cellos and basses to the right with woodwinds and percussion spread throughout— the brass are unusually placed: trumpets and trombones play behind the high strings; French horns are prominent with the low strings. Much of Talgorn’s writing is in higher registers and this unusual mixing allows brass sonorities to meld with the high strings and horns to counter the low strings. The final mix is vivid and punchy throughout and shines on this new restoration of the score. The film draws inspiration from Homer’s The Iliad, re-imagining the Greek epic as a Cold War allegory, set in a post-apocalyptic world where war has been outlawed. The battle for territory between the free Market and totalitarian Confederation is reserved for humans piloting towering machines. Market champion Achilles withdraws from competition after a spectator-crushing accident, but when the genetically engineered Athena commandeers his “bot” to take on the Confederation’s crazed Alexander for resource-rich Alaska, he returns to the fray to save his comrade in arms.